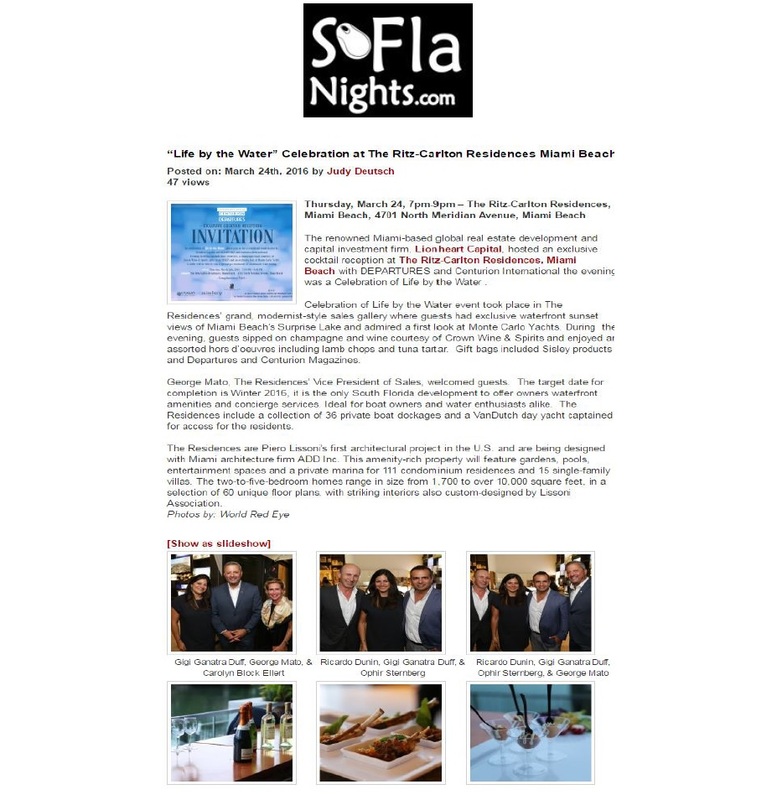 The renowned Miami-based global real estate development and capital investment firm, Lionheart Capital, hosted an exclusive cocktail reception at The Ritz-Carlton Residences, Miami Beach with DEPARTURES and Centurion International the evening was a Celebration of Life by the Water . Celebration of Life by the Water event took place in The Residences’ grand, modernist-style sales gallery where guests had exclusive waterfront sunset views of Miami Beach’s Surprise Lake and admired a first look at Monte Carlo Yachts. During the evening, guests sipped on champagne and wine courtesy of Crown Wine & Spirits and enjoyed an assorted hors d’oeuvres including lamb chops and tuna tartar. Gift bags included Sisley products and Departures and Centurion Magazines. George Mato, The Residences’ Vice President of Sales, welcomed guests. The target date for completion is Winter 2016, it is the only South Florida development to offer owners waterfront amenities and concierge services. Ideal for boat owners and water enthusiasts alike. The Residences include a collection of 36 private boat dockages and a VanDutch day yacht captained for access for the residents. The Residences are Piero Lissoni’s first architectural project in the U.S. and are being designed with Miami architecture firm ADD Inc. This amenity-rich property will feature gardens, pools, entertainment spaces and a private marina for 111 condominium residences and 15 single-family villas. The two-to-five-bedroom homes range in size from 1,700 to over 10,000 square feet, in a selection of 60 unique floor plans, with striking interiors also custom-designed by Lissoni Association.